For this post, the goal is to create a fictional movie poster that has a sense of depth to it. The idea for the movie is that I am a guy that never knows when to keep his mouth shut and the consequences that happen as a result in hilarious fashion. 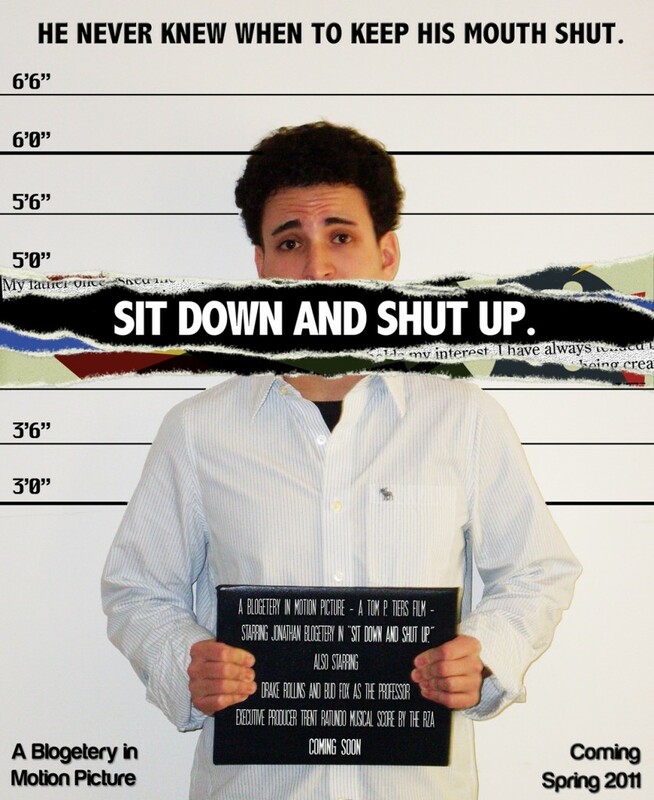 I wanted to create an old school style mug shot line up for me to stand in front of (I just used the line tool here). In the middle of the screen and to convey a sense of dominance is the title, Sit Down and Shut Up (loosely based on what a teacher told me when I was 13). The font used here is Abadi MT Condensed Extra Bold. I also lowered the tracking so the title has a sense of balance, but still stands out. 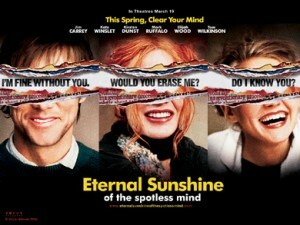 For depth, I was really inspired by the poster for the film, Eternal Sunshine of the Spotless Mind. I liked the layers having the torn look to represent the many layers of the characters of the film, until they are torn down to a layer that hardly remembers anyone. While my poster may not have a deep-seeded meaning like that, I wanted the layers to tear down to the main message, in this case the title. The torn edge look was certainly the most complex and challenging part of the design. I really wanted to give this piece a strong sense of depth and I even used other projects from my 502 class to do so. The bottom layer with the “newspaper look” is really just the About Blogetery section on this blog, but I cut in pasted it in a layer with Century Old Style font and added a destructed texture to it to give it the worn look. The blue torn layer is just the cereal box to Bloggies, but I thought the color gave the overall poster a great sense of contrast to the rest of the colors. I also used my abstract recreation as the top torn layer to help further the sense of color contrast. The torn look is a bit tricky to achieve, but I did find a great tutorial to help me achieve a rough understanding of what to do. For each layer I would use the Lasso tool to cut the picture in half. I would then do a “spotty” job of erasing the edges with a particular erase tool then go over that with a similar off-white brush tool to give the torn paper a sense of depth. I then took each of the torn layers and rotated them (to give it a busy feel) and added a drop shadow to each one for some depth. The process is long to explain, so for folks curious, I couldn’t find one on Lynda, but check out this great tutorial that goes more in depth. Aside from the mug shot line-up, which one of my friends pointed out was in the film, The Usual Suspects (doh! ), the last elements I used was the tag-line text up top (also in Abadi MT Condensed Extra Bold) with a small bevel to stand out. Also used was SF Movie Poster Condensed (a very popular old movie poster font) on my mug shot card, in this case used to feature the cast and crew like a traditional movie poster. For some more balance, I included the “Blogetery in Motion Picture” on the bottom left corner and “Coming Spring 2011″ on the bottom right. Overall, this was a definite challenge, but I think I was really able to capture depth and almost 3D perspective pretty well. I can’t really think of another way to end this blog, so I’ll shut up now (pun intended). Thank you both for the awesome reviews!